Everyone has heard the adage; “An apple a day keeps the doctor away,”” Recently, Copperleaf Senior Living Life Enrichment Coordinators (LEC), Jackie Z. and Colleen D. learned that “Laughter IS the best medicine” while attending a two day training workshop known as the World Laughter Tour (www.worldlaughtertour.com). Copperleaf hosted the event for participants from across the country and Canada. “Humor is not jokes; it’s finding humor in tough times. It’s the ability to change your attitude in difficult situations,” said Colleen D, Life Enrichment Coordinator for Copperleaf Senior Living of Marathon. Studies have shown that laughter has many therapeutic effects on the human body. The actual physical act of laughing increases the number of endorphins the human body releases which are used to decrease pain; when someone laughs from their ‘belly’ it is actually massaging the internal organs, which helps to improve circulation. Laughing so hard that your sides ache is form of abdominal and cardiovascular exercise. Steve Wilson, psychologist, originated The World Laughter Tour in 1998. To date over 6,000 people have completed the training program to qualify for the designation of Certified Laughter Leader™. 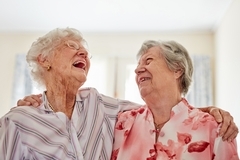 Sometimes the best therapy is simply laughter and after receiving training, Jackie and Colleen will be incorporating their laughter and learning techniques into Copperleaf Senior Living’s Life Enrichment programs. They will incorporate their laughter training into monthly staff meetings to inspire Copperleaf employees to utilize ‘laughter therapy’ every day. In a world where there seems to be a pill for just about everything, it’s reassuring that many still believe that laughter is the best medicine and learning a structure to bring joy and laughter to the world is priceless!